In the NCR region, that is subtly attached to the capital region of India, Delhi there extends two expressways that are built to let the residents enjoy the great community and work from far off places while travelling through these roads. The eastern region has been accurately acquired by the 22km long through Noida and Greater Noida. The other one runs for 18km in the regions of Dwarka. All these expressways are developed to join the regions of Delhi NCR in a better way providing the areas extending adjacent to them to the real estate developers to create more and more property in Noida and in Dwarka. These lands were also supposed to be given to the developers who want to build commercial spaces and give away office for rent in Noida, Greater Noida, Dwarka, and Gurugram. This, however, made both the regions a large hub for the working class people who migrated here from all over the country. This gave a major boost to all the realty developers to build more and more residential complexes. As soon as the areas were changing into residential complexes, the southern areas started to experience water and sewage problems. Developers were unable to provide their residents with the daily needs. However, the eastern region thoroughly enjoyed the regular facilities of water and sewage but could not gather proper funds. These developers tracked the funds from the farmers and this became a major reason to manage all the funds and thus fulfil the increasing demands of people. Also, after the demonetization process, those launched flats which were left in the middle of the construction period were unable to be delivered on the expected date of delivery. One Unitech project called Grande, located in Greater Noida was launched in 2007 and even after 10 years, it could not be completed due to inappropriate funds. Now as the government orders all the realty developers to increase the supply, these well-built flats would be sold at much lesser prices given its history of in accomplishment. These flats are built along with the Yamuna Expressway and were targeted towards those who wanted to have the luxury as they were built across an 18 hole golf course. Due to these reasons and the post demonetisation effect where people just stopped thinking of following their dreams and the wish to buy a house vanished all of a sudden, lowering the rates seemed to be the only option. These low rates would fill the empty flats and would decrease the number of new flats that were to be constructed to meet the demands after the Union Budget of 2017. The increasing commercial demand in the vicinity of West Bangalore is asking the residential sector to grow and lead the city to a better place. The Mumbai-Bangalore Industrial Corridor, Greater Peenya Industrial Area, proposed Peripheral Ring Road (PRR) Metro Rail connectivity, Dabaspet Industrial Area, integrated townships along the NICE corridor, all these factors make the west of the city an investment destination. The plots in Bangalore in this region is owned by automotive parts, manufacturing, electrical, electroplating, pharmaceutical, chemical, electronics, building materials, aerospace components, garments, castings, forgings, foundries, and scientific instruments industries. The whole area is well connected to the plunged road built over Peenya international airport, in the Mysore road. It is also connected to NICE corridor as well as the metro rail network.The well established and renowned market of Yeshwanthpur having a micro market with healthcare, retail and other public infrastructure gives a major push to people to come and live here. Shrinivas Rao, CEO of APAC, Vestian Global services stated that the major factors that increase the rates of property in Bangalore are the presence of economic complexes and industrial sectors with the perfect physical infrastructure and amazing connectivity with all public convenience nearby. It has been noted that after 2008 this western area of Bangalore was influenced by a major hike in IT and ITeS companies which came and set up their base here. These industrial areas included Kumbalgodu and Bidadi which resulted in their nearby localities like Kengeri to become a popular residential choice for those who are employed in this area or the vicinity. According to reports and databases, Kumbalgodu Industrial Area, Bidadi Industrial Area and Global village IT park, together holds a total number of 80,000 employees. Also, after the rapid metro connectivity in this region, it has become very easy for people to travel and save their working hours. With all these factors in hand, the fact that region is well connected to the NICE Road, Outer Ring Road and Tumkur Road gives the place an additional advantage to grow more property in Bangalore west. Currently, the development that is being done in this region comprises of apartment projects and plots in Bangalore West. The Kengari residential sectors incorporate a large scale of apartment projects and townships in the mid segment value people. It is thus expected that the annual residential sale growth in this region is 6-8 percent while the rental yeild will be 4 percent. The district consumer court has set out a new rule that an occupancy certificate will be issued by the municipal corporation in favour of an interested flat buyer, which will be sufficient to say that construction activity is successfully completed as per the sanctioned plan. The court also ruled that a flat resident cannot seek his case to be treated as a “representative complaint” without first complying with the necessary requirements of such a plaint. Section 12 (1) (c) of the Consumer Protection Act needs a complete publication of a notice at the time of filing of the respective complaint about the complaint to be treated as a representative case. A bench of O G Patil , V P Utpat, and Kshitija Kulkarni on Wednesday rejected the complaint by Kondhwa Khurd resident Anand Ranjalkar, who alleged that the builder of their housing scheme delivered him a 1bhk flat in Pune, which was of lesser area than it was originally agreed for, He also claimed that the builder had failed to secure a completion certificate. He also referred to common reliefs relating to the developer’s “failure” to form a society and execute a proper conveyance programme. In July 2007, Ranjalkar had openly purchased a property in Pune under ‘Kumar Prithvi’ scheme, developed by Sukumar Township Development Private Limited in Bhavani Peth, Pune for Rs 28.7 lakh. The construction firm, as said and confirmed, delivered property to him on March 3, 2009. In July 2011, after two years of getting possession, Ranjalkar filed a consumer complaint alleging the super built area of the flat was 39.87 sqft lesser than the area that was committed to him in the agreement. He said that he made the measurements done by an architect. Lawyer Sunita Kinkar, representing the firm that supplied the possession, argued that Ranjalkar was bound by the agreement, to refer any further dispute to an arbitrator and that he did not comply with the norms for converting his complaint into a representative case for seeking common reliefs. The bench, therefore, rejected Ranjalkar’s application, filed counter-arguments, for publishing a notice of a representative complaint first and held that the matter will then be treated as an individual complaint. “The complainant, in his individual capacity, cannot seek his justice as regards formation of society and execution of conveyance deed, etc. The after effects of the complainant will remain only as regards shortfall in area and completion certificate,” it held. Stop worrying more about investing in a building or a land or any property in Bangalore specially those which are close to lakebeds. The properties owned by builders near these lakebeds were told not to construct their builders as the National Green Tribunal, in an passed order on May 2016 clearly increased the buffer zone of the lakebeds from 30 metres to 75 metres and announced that no construction will be done around the 75 metres zone of the lakebeds. However, now the BBMP has given out a sigh of happiness. They have clarified that those projects which recieved their contrsution approval before May 2016 can resume their construction. These will be only applicable to those who got licened before the NGT order arrived. BBmp recently issued a circular on 30th March 2017 which came out with the green signal for the buiilders. Commissioner N Manjunath Prasad ordered that the NGT directive will be now not be applicable for site and properties which already secured their plan before the Green Court came out with their new orders and restrictions. This implementation sent to all eight zonal heads has brought out a relief to the real estate sector and is expected to grow the market as well with the increased rates in such locations. 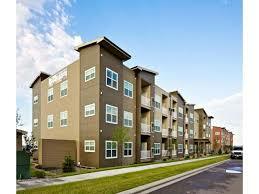 Now the builders are excited and are offering new deals in their flats in Bangalore lakebeds. These areas are now more costlier than ever. The serenity of the lakebeds of Bangalore has always been an ideal place for all the segments of the society and is much desired specially by old people who plan on living their old age in a wonderful environment as same. Not only flats, but some builders are now planning on moving to lake house projects. They are now applying for permissions for their beautiful projects from the NGT and are expecting great revenues for the real estate market. To manage Bangalore’s reputation of the country’s famous IT Hub, the BBMP has come out with a new rule which will be in favor of the technology. To ease the builders who own and want to convert them into a building for residential or office use, the procedure for getting the plan approvals will be done online. This was cut straight to chase the builders won’t have to run to post to seek clarifications. For this work, new executive engineers will be assigned the work of approvals. They will collectively work with zonal town planning officers. This will be done in lieu of the latest E-Khata system announced in the BBMP budget on Saturday which said to enable the citizens to upload all the required documents and to avail their khatas online itself. Apart from this, the property tax collection which needs to be done will be carried forward by the geographic information system (GIS) in a collection with the Indian Space Research Organisation, according to the chairman of BBMP standing committee, MK Gunashekar (finance and taxation). A digital survey of the whole Bangalore real estate will be carried out which will include tech parks, malls, and other commercial establishments, as well as the residential market of Bangalore, will be minutely undertaken to ensure accurate evaluation of property tax. With the high increase in commercial activity in North Banglore region, the demand for residential sector also gets affected. New residential projects are being launched in this area which comprises of both apartments and Luxuroy homes (villas). Bengaluru provides flats for sale in affordabe prices. The development in this area offers residential spaces for all three budgets; premium, mid range and luxury. Areas like Thanisandra, Yelahanka Doddaballapur, location near airport offers mig segment housing to its buyrers whereas, for luxury living one has to look for available in and arond Hennur Road, Kogilu, and some parts of Thanisandra. New flats for sale in Hebbal-Yelahanka stretch of Bellary Road, which includes Hebbal and RMV II Stage has luxury apartments in the price range of Rs 8,000-12,000 per sqft. The areas situated beyond Devanahalli till Doddaballapur is very popular as it comprises of a large variety of high-end villa projects and also, plot development projects. The price here ranges between Rs 6,800-12,000 per sqft accumuating an area range of 2,500-7000sqft. Meanwhile, the plot development projects in this area ranges from Rs 2,150 to 4,000 per sqft. Plots as well as luxury flats in this region are mostly preffered by high net worth individuals and investors due to their ability to serve as good holiday or retirement second home options. Apartments towards Nandi Hills Road are looked at with a keen eye as they range between Rs 7,300-10,00 per sqft. Vijayoura has new flats for sale ranging between 4,500-5,050. As it is known that there is a large workforce employed in the area of Whitefield, and preferring to live in the vicinity, is increasing up the demands for residential options here for the comfort of the employees. Once known as a secluded area of Bangalore to the Silicon Valley of India, Whitefield’s story was shaped primarily by the IT Hub revolution that changed the sleepy landscape with Asia’s first tech park which rose up in 1994. The excellent development that took place in Whitefield and the EPIP zone have seen over the years seems like a page of a fictional book with a perfect ending. Mammoth towers in glass and chrome stand tall amidst natural greenery which has been long preserved by the developers of these MNC acquiring most of the Bangalore properties especially in Whitefield. Many hitherto heavy manufacturing factories have given a big hand to making this a wonderful place with a lot of infrastructural possibilities and residential flats in Bangalore. It is no wonder that after all these factors these localities in the vicinity of these ultra facilitated tech parks have largely begun to mushroom into elite gated communities of residential buildings. Villas the high priority choice by the people who want to live here and work in these high-end vicinity of business parks. While the ITPB has singularly driven the demand for residential property options in its vicinity, the other tech parks and business parks in the EPIP zone too have drawn a high demand for housing options ranging from mid-segment apartments and high-end homes enclosed within well-appointed gated enclaves, to villas and plots. A member of the committee, Jain has stated that Whitefield, Electronics City, and the EPIP zone was a major initiative taken by the government to create the place into something better which eventually turned out to be called as the Silicon Valley of India with a number of reputed Multi Nationals setting up their base here. This is also increased the demand for high-end flats and villas by the people who come here every year from all over the country to earn their lavish living. With Kolkata residential market still trying to rise from the after effects of demonetisation, developers have started applying their tricks to attract more and more customers by offering them innovative schemes. The price protect schemes that were launched recently with the budget, in which the interested consumers would enjoy the benefit in case there will be any decrease in property rates, have helped in increasing the demands by 15% after the two months that followed the demonetisation. Jitendra Khaitan, CMD of pioneer Property Management Ltd. Have stated that the Market is facing a positive growth and that approximately 50% hike in queries is expected along with a hike of 10-15% in actual sales. However, the price protect scheme is temporary, it will still effect the market majorly and increase the real estate market to a great extent in profit. Khaitan also put out the word that these schemes are highly helping the market recover from the downfall after demonetisation. After the demonetization struck the nation there was almost up to 40% drop in queries and sales of homes in and around Kolkata as buyers waited for a fall in real estate prices. Ghaziabad is popular for serving to the mid-segment and affordable housing segments. The very known housing clusters such as Kaushambi, Vaishali and Indirapuram are now a major part of Ghaziabad property in terms of increasing the real estate. Apart from this, the new upcoming residential locations include Raj Nagar Extension, and other areas along NH-24 which are beyond Indirapuram, and incorporates Crossing Republic Township. The only thing bothering the developed locations is the lack of space for further high-level development. These places majorly include Kaushambi and Vaishali. The 1BHK Flats in Ghaziabad are now available to meet all the residents and is expected to have a healthy capital appreciation. The recent projects mostly kept its focus on upper-mid and premium segments offering them new upgradations which were beyond anybody’s expectations. The affordable residential clusters which are mostly 1BHK Flats and located in Raj Nagar, Shahibabad are in the average price range of INR 2,200-3,500 per sq ft. The upper end of the range is commanded by projects which are fully completed or nearly ending its construction in Crossings Republic, whereas the newly passed projects in NH-24 are in the lower price band of INR 2,200-2,600 per sq ft. The Raj Nagar Extension corridor on NH-58 is has a price range in between INR 2,600-3,000 per sq ft range. 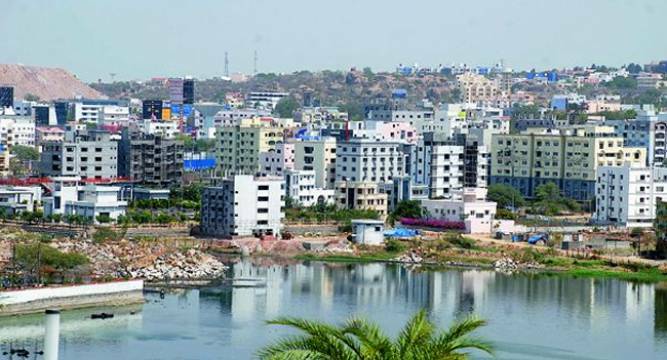 Hyderabad is now becoming the new investment destination for the commercial property developers already based in Bengaluru. This is the time when the city’s real estate market is on a revival mode after almost five years of political ups and downs in the city. Well developed companies such as DivyaSree Developers, Embassy, Salarpuria Sattva, and RMZ Corp have successfully built or still are in the process of building a noticeable commercial portfolio in the city. This, along with Bengaluru, which is also a home to some of the largest IT companies in the world, including Microsoft, Oracle, and Uber. However, the rentals of these cities are still not as high as other cities and therefore the companies are keenly looking at this as a growth trajectory. As it is mostly seen, the existing customers of the city will be now looking in other cities as it provides them with more options and a higher scale for a better business. This However will result in the same rental prices of Hyderabad commercial property as it is for Bengaluru. Mike Holland, the CEO of Embassy Office Parks said that it can be strongly seen that the Hyderabad infrastructure will grow immensely after the political turmoils in Bengaluru. The Real Estate’s new Union bill spells happiness for Greater Noida homebuyers, as the recently rectified budget will give more powers to those who want to buy plots in Greater Noida and will also keep in mind the concerns of the builders to a major extent. The Real Estate Regulatory Bill directly aims at bringing transparency in the real estate sector. However, the announcements were being planned from a long time but the finance minister made the right time to announce all of it with the Union Budget of 2017. However, after demonetisation, this area has more supply for residential units and less investors but after the affordable housing schemes it is turning out to be the opposite. Most of the housing units sold in Greater Noida now have a lot of takers but have less supply. Therefore, after taking some major steps a mega plan has finally been sorted out to cater affordable housing for all till 2022. The budget is expected to establish state level regulatory authorities RERAs with whom developers have to register projects above a certain size. If this will not be carried out, the builders will have to pay major fines. The developers will now state all facts like possession dates, construction quality facts public on their websites so as to give clearer picture. The developers will have to focus more and more on the affordable housing. They will now be providing 3bhk flats in the price of 2bhk. All these new rules are expected to set transparency in greater Noida properties. The Big Impact is that this will prompt homebuyers to purchase property without the fear of being cheated. This will bring in more creditability to investors and the belief to invest in the real estate sector. This will also give a clear legal recourse in case of any dispute or delay in the construction. This has helped people who were interested in buying in Greater Noida as with this law the problems of the dust made by demonetisation will settle down and more over the development which tends to cater the needs which was stalled for a long time is finally getting its breath back. This is helping the Greater Noida real estate sector to become more transparent and the work has finally resumed and the building which were left unreconstructed the last quarter, are now coming to an end to supply its consumers their dream home. Where to buy your house in Bangalore? Like every other place, Bangalore also hit itself hard with demonetisation. This deeply effected the realty sector which consequenced in the announcements on Akrama Sakrama Scheme, National Green Tribunal’s drive to reduce the lake beds in the city. However, this is now beginning to change with the initial dust of demonetisation finally settling down. With the Union Budget Announcement, which extended a big hand to support the affordable housing, the demands have increased yet again. Bangalore is reported as the third largest hub for High Net Worth Individuals which increases the demands for luxury housing in the form of apartments or plots in Bangalore. As the southern and eastern zones of Bangalore are popular for their commercial complexes and workplaces, major residential demands are fed by these areas. With a 4% increase of ready to move in demands, a data was collected about where should buy their properties according to the budget. For those who wish to manage a housing within 40lakhs have a number of options to choose from sppecially in the IT hubs such as electronic city. 1bhk Flats falls the most popular under this category. Amonsgt married couples who choose to live in the city regarding work, opt for a 2bhk house in Electronic City, Whitefield or Bannerghatta Road. The residential demand in these areas are the highest and always dominate the popularity charts with a perfect capture of 40% of the total demands. Apart from this, the Bangalore real estate is not keeping the 3BHK Flats and private villas aside and are launching new apartments under the category of 60lakh to 1 crore in areas like Hennur which have large scale infrastructure, easy connect with outer ring road and the international airport. Apart from Hennur, Kanakpura Road and Hebbal are also set with their ready to move in flats to meet the expectations of investors who desire luxury laced with tranquility. Now for those entrepreneurs who does not wish to compromise on their lavish living and royalty, Bangalore is providing them plots and private villas in the range of Rs 1 Crore- 2 crore in areas such as Sarjarpur Road and Arekere. These have recently turned out to be a royal investing for the rich entrepreneurs which are mostly HNIs. The last quarter of 2016 struck all of India with major impacts on real estate sector. In terms of Hyderabad city, the real estate sector have been really promising this quarter. The initiatives taken by the government have been fairly positive towards the residential sector. After demonetisation settled down, the GHMC recieved a total of 154 crore as it begun its decision to accept the banned currency from property tax payers. This meant that the currency accepted from the defaulters could be used in a constructive manner. Hyderabad’s realty experts have expected that Hyderabad commercial market will soon become the leading market all over India, latest by 2018. The main reason behind this is the healthy accomplishment of affordable housing which therefore boosts the residential market as well. 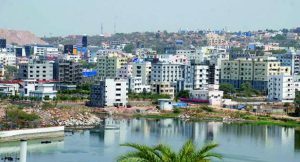 As the newly reputed companies are starting to set their base in the city, the residential supply in Gachibowli, Hitec City and Raidurg will increase. These residential sector are expected to be consumed by the expected increase of employees from 4.3 to 4.7 lakhs within the next 12 months.